This workshop is designed to capitalize on the concentration of experts and junior researchers gathered at IMA and the desire of Japanese scientists and mathematicians to investigate the phenomena of the title, which are best described by infinite-dimensional dynamical systems. The workshop is a fitting end to the program and the expected synergy will be a boon to science in both the US and Japan. Japanese participants would be fully funded by Japanese agencies. Spatially localized structures occur frequently in forced dissipative systems. Well-studied examples include localized spots or cavity solitons in a driven optical cavity, localized surface peaks in a ferrofluid subjected to a normal magnetic field, and localized electrical breakdown in a gas discharge. Other well-known examples include spatially localized oscillations called oscillons, first identified in vibrating granular media and subsequently observed in vibrating polymeric liquids. Convectons or spatially localized convection are present in binary fluid mixtures heated from below. Recent studies of the onset of shear flow turbulence have revealed localized turbulence, in the form of stripes or patches, prior to the development of the turbulent state. Buckling of slender structures leads to spatially localized deformation. Other systems such dewetting thin liquid films on a substrate or flowing over a heated substrate exhibit some of the same behavior. Experiments show that these structures may be stationary or move, and have a tendency to form a variety of bound states resembling molecules. In addition they mayundergo instabilities leading to fission, replication or disappearance. Such experiments often show that distinct spatially localized structures coexist and are simultaneously stable. This type of behavior generally occurs in the region of bistability between a homogeneous or unstructured background state and a spatially periodic or structured state: the resulting localized states consist of an inclusion of the periodic state embedded in the homogeneous background and connected to it by fronts. These structures differ in their size, and numerical modeling indicates that they lie on a small number of solution branches in a bifurcation diagram that snake back and forth across part of the bistability region. This mechanism for creating infinitely many coexisting stable localized structures is commonly referred to as snaking, and is now known to occur in the partial differential equations of nonlinear optics and fluid dynamics. In one spatial dimension it has been analyzed comprehensively via asymptotics beyond all orders and dynamical-systems techniques in a fourth-order model equation, the SwiftHohenberg equation, which serves as a paradigm or normal form for this phenomenon. However, many important questions regarding snaking are still unresolved: for instance, except for a few numerical studies, not much is known about the multi-dimensional case, about the properties of bound states or indeed about time-dependent structures such as oscillons. Much recent effort has focused on reaction-diffusion systems, leading to considerable advances in the theoretical understanding of the dynamics and stability of localized pulses for two- and multi-component reaction-diffusion systems in one spatial dimension. Equations such as the Gray-Scott model are of interest in theoretical chemistry but related equations arise in nonlinear optics, and electrical gas-discharge systems. Theoretical tools to characterize the collision properties of pulses and spots, and their interaction with spatial heterogeneities, have been developed using computational global bifurcation approaches combined with dynamical systems theory. Among the major challenges for the future are the characterization of the stability and dynamics of localized structures in reaction-diffusion systems on multi-dimensional domains. Computational approaches such as numerical bifurcation and continuation studies have played a significant role in discovering and illuminating many of the phenomena mentioned above. Numerical computations have also helped to understand experiments by facilitating comparisons with models and by making predictions from models in cases where experiments are difficult to carry out (examples include fluid flows and buckling). The mathematical theory for the stability, dynamics, and bifurcation properties of localized states in various PDE models, including normal form systems such as the Swift-Hohenberg model. Numerical simulations, asymptotic theory, and mathematical models characterizing localized patterns in various specific PDE systems arising in applications. Real-world physical experiments and realizations of localized states in fluid convection, optics, gas-discharge systems, and chemical systems. The examination of such experimental phenomena by theoretical models. Over the past 10 years there has been a growing interest in developing new theoretical tools to analytically characterize the stability, dynamics, and bifurcation properties of different types of localized patterns in various PDE models, motivated by both numerical simulations and physical experiments. 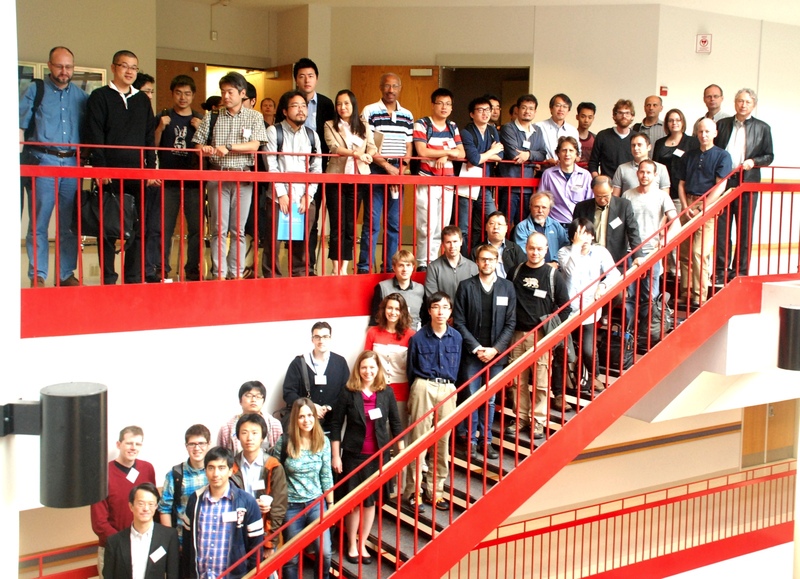 To date there has not been a large-scale international meeting for a broad-based examination and critical overview of the recent advances made in both the theoretical understanding and experimental realizations of localized patterns in in a wide variety of contexts, such as nonlinear optics, fluid dynamics, reactiondiffusion systems, normal form PDE models, granular media, thin liquid film models of dewetting surfaces, etc... Our proposed workshop will bring together leading international researchers in various aspects of localized pattern formation, with a goal of uncovering common theoretical approaches that can be used to characterize localized states across a range of diverse applications.